Atlantic Yards Report uncovered a couple examples of bogus blight after reading the Blight Study, released along with the Draft Environmental Impact Statement and General Project Plan. They’re counting as an element of blight, the Vanderbilt Yard railyard. I’m not sure it qualifies as blight; it’s in active use by the MTA and LIRR… There’s been no effort by any state or city authority for at least the last 30 years to develop it. It could also be considered an asset. If the state-owned railyards have never been developed, can they be considered "blighted?" If not, then the percentage of "blighted" property in the footprint drops dramatically, as seen in the side-by-side comparison. In another post, AYR explained that much of the non-railyard property in the footprint is deemed "blighted" because it is underdeveloped, meaning either at least 50% of the lot is vacant or the property is developed to less than 60% of the allowable Floor Area Ratio (in other words it isn't big enough). 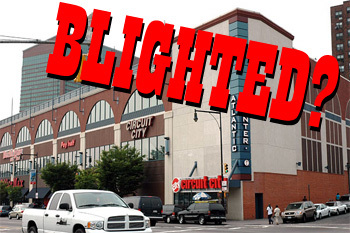 Under the 60% rule, Bruce Ratner's own Atlantic Center Mall is, like, mad blighted. The Empire State Development Corporation is bending over backwards to make the case that the area is "characterized by blighted conditions that are unlikely to be removed without public action."